Choose Klean-Heat: it's premium, clean-burning oil lamp fuel. It's a little bit more expensive than some fuels you can buy, but we think it's worth it. This stuff is amazing! The flame in my lanterns can go much higher before sooting and there is almost no odor. I have an antique Dietz Vesta that has a run away flame with kerosene and lamp oil but works perfectly with KleanHeat. Lehmans is the only place I've found that ships it to Canada but unfortunately with the import duty it works out to about $60/gallon. After finishing a bottle of liquid candle wax in my Dietz lantern, I decided to check this product out as an alternative since it was cheaper. I settled on getting this lamp oil precisely because of it's advertized lack of smell. 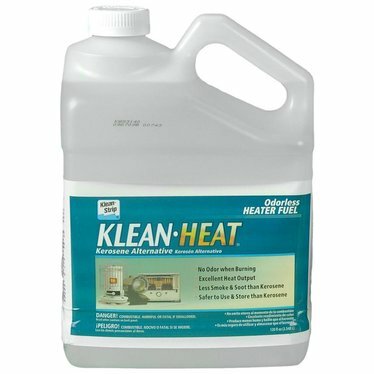 Lets just say it's safe to bet I will never be ordering Klean heat again. Upon first lighting, it doesn't seem so bad. Then you smell the fumes. If used in an indoor space, the stench is almost enough to give you an instantaneous headache! I immediately went and bought another bottle of the liquid paraffin Lehman's also sells. Now that one is completely odorless and you won't smell a trace of it even after several hours. Good oil but, for 20 bucks I expect to get A FULL GALLON your jug is quite a bit short of that mark! I bought this oil for my lamps, after the first use I felt sick and very light headed and had to leave my home to get some fresh air - leaving all the windows open. I thought maybe it was first time use odor - but the second time it did the same thing. Now I have oil that I can only use outside - disappointing. Dietzman said on 12/30/12 I read somewhere that real kerosene burns better than any lamp oil, but I am really pleased with this Klean-Heat substitute. No, it isn't really odorless, but the smell is at least 1/2 that of kerosene. I also believe that Klean-Heat isn't as hazardous as kerosene, although I am not at all afraid of using real kerosene. I am glad that Lehman's is selling this product, because Lowes and the Home Depot don't always have it. The cap on the one gallon jug actually has a rubber seal in it, to prevent leakage and/or evaporation. If you were wondering, I use Klean-Heat in my Dietz Blizzard lantern. SO-much better than the regular kerosene, and way-better than the wick-clogging paraffin. Burns even, clean, and with only a very-slight-hint of smell upon first-lighting. Pricey, yes---but it's worth the trade-off for indoor use. In my case, it seems to feed better than the Aladdin-oil, in my non-Aladdin-style lamp, but that's just an opinion. The best! I use it in my oil lamps and my kerosene heater. It burns brightly, and the smell is slight (noticeable with the kerosene heater, not so much with the oil lamps). My only complaint is the price. I can get it for under $12 for the same size bottle at Lowe's! Wow..I love this oil! It burns very brightly, and we don't smell anything like some reviewers state. You can smell it when you pour it from the container to the vessel, but once the lid is back on, there is no smell. I recommend this to anyone. This is great lamp oil. I am very sensitive to chemical smells. The oil does smell like Kerosene, but when it burns, there is NO odor. I have now purchased 2 cases of this oil and will purchase only this oil to burn in my lamps. we use it at night for the outdoor lamps on the porch and patio/outdoor summer kitchen (mainly due to the odor; we use Aladdin lamp oil for indoor use). It burns brighter w/o the smoke. a good substitute for parafin or kerosene. Good stuff. This is a high quality lamp oil that burns without smoke and VERY little odor. I was completely impressed on how wonderful the packing was for shipping. And the order arrived very quickly. This is the brightest burning odorless fuel I have found for my lanterns and oil lamps. I was using aladdin but this is brighter and I think has a lot less odor than the aladdin oil. I am very sensitive to the kerosene small and this is the most tollerable fuel I have found. I am able to find it locally seasonally but I am glad Lehman's offers it year round so I can get it when ever I need some. My review is for the Klean-Heat fuel I bought for my kerosene lamp. It is a terrific alternative to kerosene. Burns bright, no soot, or offensive odor. The order was processed and delivered quickly. I would recommend this product to anyone. Seems to burn clean but it's definately not odorless. You'll smell it in a room. I bought this fuel for my lanterns. It's great, it moves up the wick well, gives off great light, burns clean and doesn't stink. Awesome fuel! it moves up the wick beautifully and even makes the light brighter. excellent value. it really does burn without smoke or odor.